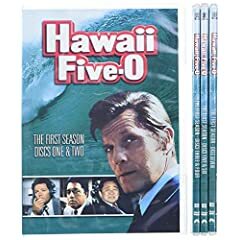 Hawaii Five-O is quite possibly the longest running cop show on TV, it was on for twelve seasons running from 1968 to 1980. One of the reasons for the success was Jack Lord. Lord had a commanding presence on the screen, enough that they replaced him as Felix in the Bond movies for fear of over shadowing their star. He’s a no nonsense cop who is un corruptible and always gets the job done. Hell, I’ll admit it, I still want to be Jack Lord! The supporting cast was also strong with James MacArthur as Danny Williams and a host of local actors making up the 50 team. I put in the first season a little nervously, I have very fond memories of the show and I was hoping I would see the show I remembered, not a dated over done tv show. I was wrong to be worried. While naturally a bit dated, it is almost 40 years old, the police work holds up, the acting is still strong, and its jus beautiful to watch. I did recognize a few actors and actresses including Sally Kellerman. It doesn’t really take much to get past the clothes and the portrayel of hippies with their cool talk daddio.And I actually appreciate a plot that revolves around slipping an old man acid. Special features are slim, but there is a very nice show taped for Hawaii Television doing a look back at the show with interviews and great stories. The shows were all remastered as well and came through very sharp and with great sound quality. That sound quality really came through when the theme song kicked in, I had it up really loud!This is a great addition to any collection of crime or mystery related DVD.